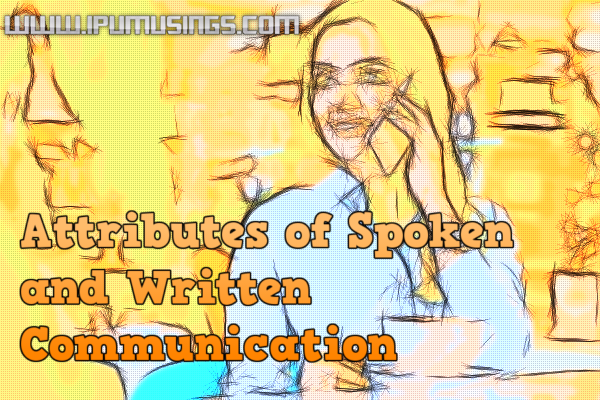 Communication takes numerous structures as indicated by the event and circumstance, the connection between the people, the medium, symbols and the images utilized, the style of articulation, and many other factors. Spoken or oral and written communication are both forms of verbal communication. Oral communication is more natural and immediate. Oral communication requires that both the parties should be present and attentive at the same time. Written communication has to be used when the other person is not present and is not available on the telephone. Long and complex messages are best conveyed in writing. Written communication is slower in preparation, in conveyance and in reception; it takes more time to draft, type, dispatch, and to receive and read a letter than it takes to speak, and to hear, listen to, and understand an oral message.Feedback is also slower in written communication. Written communication is more precise and accurate than oral. Choice of precise words is possible in written communication because the writer has the time to look for suitable words and phrases, and to revise the draft, if necessary. Accuracy is necessary in written communication because the receiver is not present to ask for clarification. In oral communication, it is not always possible to be so precise in the choice of words. furthermore, the message contorted. Composed and written records and reports are more 'dependable and acceptable. Written communication requires stationery, preparation, and transmission, all of which cost money. Oral communication can also cost a great deal since it requires simultaneous presence and attention of the two parties, and getting together costs money. Oral communication is supported by the speaker's body language and para language. The speaker can control the style of delivery, giving meaning to words and sentences by voice inflexion and facial expressions and gestures. Written communication is separated from the writer's bodily presence and is more in the control of the reader. A written message is usually shorter than an oral communication. The situation of oral communication requires some preliminary and closing remarks, while for written messages there are standard formats for opening and closing which can keep the message short. Spoken language tends to be less formal than written language. When a language is spoken, there are abbreviations and dropping of some sounds, as in can't, won't, don't, I'll, we'll. The vocabulary used in written English is also more formal than in spoken English. Oral communication allows immediate feedback; the listener's face gives some feedback and the speaker can modify the message on the spot. Clarifications can be sought and given at once. A conversation can be brought to a satisfactory conclusion by continuous exchange of ideas and views. In written communication the feedback is delayed; the reader's facial expressions cannot be seen by the writer; the reader's response is known to the writer only when the reader replies.